Exterior: Mud, leaves, dirt, and falling tree limbs can damage a car’s exterior finish. A nice coat of wax will help to protect the vehicle’s finish. Windshields should also be inspected for chips, scratches, or cracks. Any sort of vulnerability in the glass could cause the windshield to crack or break. Replacement will be necessary for cracks or irreparable chips in the driver’s line of sight or if the windshield is damaged by falling tree limbs or other large debris. Windshield wipers: Wiper blades are made from rubber and the extreme temperatures break down rubber components. Additionally, high winds can damage the wiper’s arm. Check to ensure they are in proper working order before an unexpected rainfall. Also, remove leaves and other road debris from the space between the windshield and the hood. Debris inhibits the washer fluid from flowing freely and the air intake for the air conditioning. Washer Fluid: Though the monsoon may bring heavy rains, some areas of the valley may simply get drops of rain mixed with dust in the air from heavy winds, creating dirt spots on your windshield. Make sure your washer fluid is adequately supplied to clean the windshield as to not impede your view of the road. Under the hood & trunk: Leaves, pine needles, and other debris may get stuck in the water drainage gutters built into the vehicle to release water off the vehicle and out of the trunk. Such debris can also get stuck in door jambs, allowing water to accumulate, which may lead to rust and eventual leakage into the interior of the vehicle. Air Filters: Once monsoon season has ended, it’s best to have both the cabin air filter and air filter inspected. These filters pull in air from the outside and after time get clogged from particles in the air. Lights: While not just limited to monsoon season, for safety reasons, always make sure headlights, taillights, and turn signal lights are in good working order. 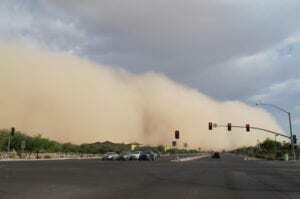 Haboobs, or the large wall of dust, and heavy rains will require you to utilize your lights so that you may see the road as well as making you more visible to other drivers. Tires: Monsoon rains come down fast and heavy, creating a plane of water on the roadway. This plane can cause loss of control of your vehicle. Wet conditions and underinflated tires or worn-down treads increase your risk of a tire blowout. Brakes: The most important safety feature your vehicle is equipped with. Have a certified technician inspect your brakes prior to monsoon season. The worst time to find out you need brakes is when you need them most. Take caution when driving in the rain, as rain can affect the brake’s ability to stop the vehicle. Puddles of water full of mud and other debris can obstruct brakes or cause damage and must be checked often. Monsoon season is a much-anticipated event for many Phoenicians who wait all year for the lightning to light up the sky, the booming crackle of thunder, and watching the phenomenon of a haboob hundreds of feet into the air. While monsoon season is exciting, it can be dangerous. Driving in wet or extremely dusty conditions can be risky and ensuring that your vehicle is up to the challenge is important. Inspect your vehicle or have your vehicle inspected by a trusted mechanic in June and September to prepare your car or remedy any issues that your car may have encountered during a storm. We, at Sun Devil Auto, are familiar with monsoon season and the destruction they can leave behind as well as how it affects your car or truck. Our technicians know specifically what to look for when it comes to what your vehicle needs to stand up to the harshness of a monsoon storm. Bring your vehicle in before and after monsoon season to have your vehicle inspected for your safety. As part of the Sun Devil Auto oil change, we include a multi-point inspection. Each oil change includes lube, oil, and filter, a top off of fluids, and tire rotation, and your vehicle is thoroughly inspected at no additional charge! Bring your car into Sun Devil Auto in June and again in September and in the meantime, sit back and enjoy the storms with other valley residents, confident that your vehicle is prepared, come what may.